On Tuesday 10th November, Rhun ap Iorwerth, AM for Ynys Môn, attended a Senedd event hosted by the Heritage Lottery Fund (HLF), to find out how people from their constituency can secure new National Lottery money to help them mark the Centenary of the First World War. 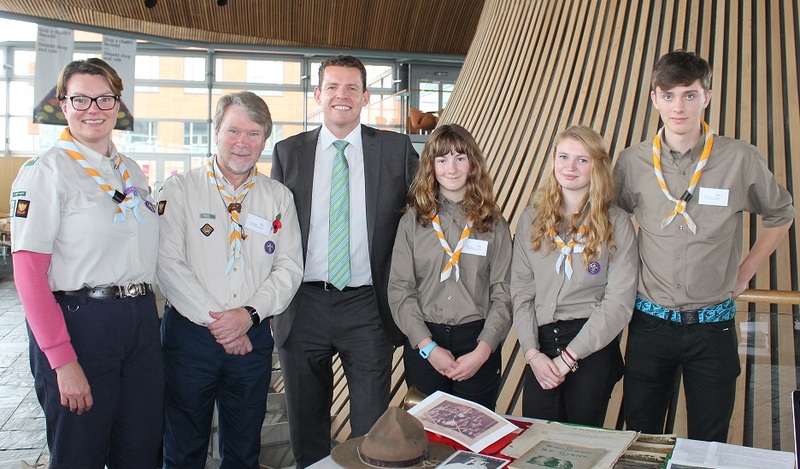 At the Senedd event, Rhun had the chance to meet with members of Menai Bridge Explorer Scouts, who have received funding from the Heritage Lottery Fund (HLF) for a project to explore the role of Scouting around World War I.
HLF has now made an additional £4million available in 2015/16 for communities looking to explore, conserve and share local heritage of the First World War. Grants are available between £3,000 to £10,000. The event showcased just a handful of 79 First World War Centenary projects taking place across Wales, thanks to more than £5million of investment from HLF.